If you asked a typical American to list some famous astronauts, surely you’d hear the names Neil Armstrong, John Glenn, Alan Shepard, or Buzz Aldrin. If you asked someone to list some famous cosmonauts, the name Yuri Gagarin would be the second most likely response, behind a blank stare. From an American point of view, the Soviet space program was threatening inspiration. The Soviets won the race to put an artificial satellite in orbit with Sputnik, they won the race to put a human in orbit with Gagarin, and they gave America a sense of urgency in the race to the Moon. 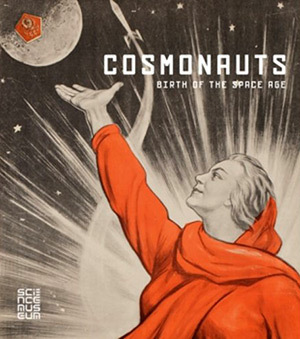 Cosmonauts: Birth of the Space Age tells the story of human space travel from the Soviet point of view. Cosmonauts is the companion book to the special exhibition at the Science Museum in London. The 10 chapters are written by different authors and each chapter has its own unique perspective and style, but the overall theme downplays the notion of a space race and emphasizes the importance of the long haul. The problem with a space race is that all races come to an end. Only four years after Neil Armstrong’s historic giant leap, the Apollo 17 lunar module left the Moon, which has been uninhabited for more than 40 years. This book highlights the Soviets’ long-term focus on spaceflight through the Soyuz program, Mir, and future travel to Mars. Two early chapters are written by descendants of giants in rocket science. The great-granddaughter of Konstantin Tsiolkovsky discusses the life of the man who derived the rocket equation in the late 19th century. If Tsiolkvosky was the father of theoretical cosmonautics, Sergei Korolev was the father of practical cosmonautics. Korolev’s daughter was able to give her chapter in the book a very personal touch. In 1938, Korolev was arrested by secret police during the Great Purge. He confessed to committing anti-Soviet activities, only to spare his wife from arrest and his daughter from an orphanage. After two years in the gulag, Korolev was transferred to the Tupolev prison-factory, where he designed bombers for the Soviet military. Seventeen years later, Korolev’s rocket sent the first artificial satellite into orbit. Less than 800 days after Yuri Gagarin became the first man in space, Valentina Tereshkova became the first woman in space, preceding the first American woman in space by 20 years. Tereshkova’s daughter uses some unpublished private letters to reflect on how the child of a war hero turned a hobby of skydiving into being selected the first female cosmonaut. This chapter gives a thorough look into the rigorous training program at Star City and describes the tense moments on the day of a launch. The highlight of the book is the story of Vladimir Dzhanibekov’s 1985 mission to repair the Salyut-7 space station. The unmanned station had lost power and all communication with Earth was halted. A crew needed to be assembled quickly, and it would be up to Dzhanibekov to dock with the station in manual mode. He compares the process to parking a seven-ton dump truck with no snow tires onto a specific position on a frozen lake; time and fuel were limited, so it needed to be done as quickly as possible. Without the computer systems working on Salyut, the repair crew needed to use binoculars and hand-held laser measuring devices to make sure they were on the correct trajectory. It would be impossible to condense the entire history of the Soviet space program into 10 chapters, but this book serves as a great introduction for readers who would like to learn more. As the companion piece to a museum exhibition, there is no shortage of incredible photographs of historical artifacts, from pages of Tsiolkovsky’s sketch books to actual space suits and capsules. The final chapter of the book references a blog entry of an Italian scientist, who discusses the need to send artists into space as well as scientists. “One of the particularities of humans is their ability to translate what we see, hear, experience into a media format with a soul: into art.” The translation of the Soviet space experience into paintings, posters, and sculptures in this book serves as a worthy substitute for anyone unable to visit the Science Museum in London. Christopher Skillman is a financial analyst and amateur space enthusiast and has lived in New Jersey, Boston, and Virginia.